Victoria Day is a Canadian holiday, but that doesn’t mean it can’t be celebrated around the world. 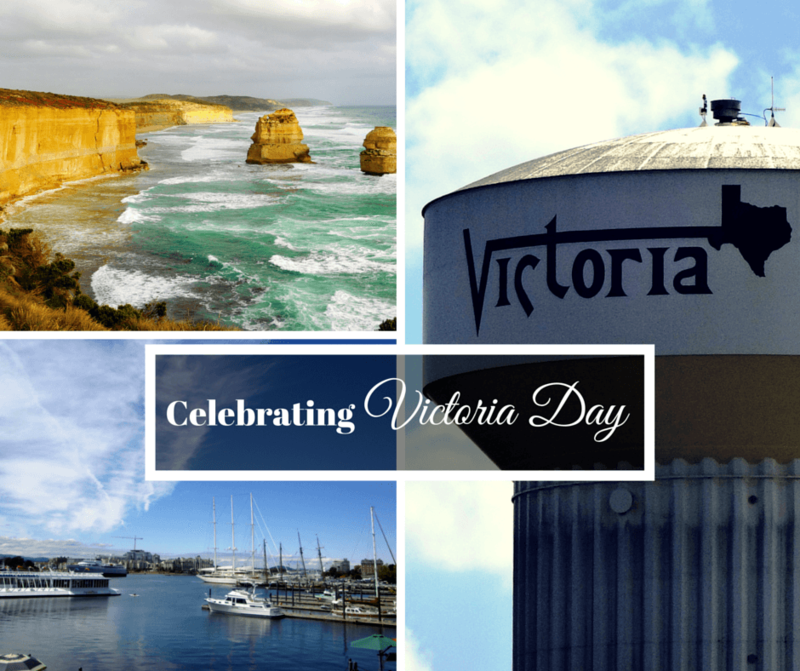 And what better place to celebrate it than a place named Victoria? I’m not sure how old I was when I realized there was a “Victoria Day.” But I thought it was the coolest thing ever. A holiday dedicated to me?? How awesome was that?? I’ve been to a few already, but a couple of my blogger friends have suggested even more places to visit that were named after me Queen Victoria. Victoria is the second smallest and second most populous state in Australia. Located in the South East corner of the country, it packs a huge punch. We live in the capital of Melbourne – a city of over 4 million which is full of fun things to do. It is known as the sporting, cultural, shopping and eating capital of Australia and it’s lots of fun trying out all of these things. I particularly love all the great food and the fact that there is always a fun event to go to. There is plenty to do in the rest of the state too. From watching the penguin parade at Phillip Island, to the scenery on the Great Ocean Road, to panning for gold in Ballarat, to tasting top wines in the Yarra Valley, to visiting the many beautiful beaches and towns, there are plenty of great things to do in this Victoria. Victoria (the capital of British Columbia, Canada) is located on the east side Vancouver Island. I’ve been to Victoria a few times and I love visiting this city. Victoria has relatively mild weather (compared to the rest of Canada) so the gardening season is longer there meaning I can go to Victoria and see beautiful flowers when there might still be snow back home. Victoria is small and easily walkable, but there is still a lot to do there. I love getting a tuna tacone from Red Fish Blue Fish, a seafood restaurant located right on the harbour, and watching the float planes and boats go by. The British Columbia Legislature is across from the Inner Harbour and you can get a free tour of the building. There’s also the nearby Empress Hotel, which helps give Victoria its sense of Britishness because they have high tea there. Last time I was in Victoria, I went to Miniature World (more for kids, but I still loved it), visited Craigdarroch Castle (a historic mansion now turned museum), and did a whale watching tour. Located near the Gulf of Mexico, Victoria is a growing city in the county of Victoria (so cool!). It is part of the Main Street Program, which is dedicated to historic preservation, innovation, and community pride. There are a lot of cute locally-owned shops, up-and-coming restaurants, and great architecture. They also have a great Framer’s Market where they have arts and crafts, food vendors, and music. Victoria Street, Victoria water tower, and artwork from the farmers market. Of course, if you’re in Great Britain, you’re sure to find a lot of places named Victoria as well. The Galapagos: Sea Lions And Iguanas And Tortoises! Oh My! Thanks for including my contribution to this post. I didn’t realize how many places in the world are named Victoria in the world. I definitely want to visit Victoria State in Australia, and I’d never heard of Victoria, Texas but it sounds like a nice little city. I also realized within my own hometown (Edmonton, Alberta) there’s a Victoria Park and a road called Victoria Trail. I’ve never heard of Victoria Day before. Since the Canadians have it, I would imagine the British have it too, right? Victoria is a very beautiful name and so are all these cities named after the famous Queen. Lucky you to have visited some of them. I haven’t seen any. I had a mini celebration for Victoria Day in England! That photo of the Great Ocean Road is stunning. Awesome Carly! What did you end up doing? Who knew that there were quite a few places called Victoria?! I’ve been to BC but unfortunately never made it to Victoria, just an excuse to go back! Hahah! Great idea for a post. The Great Ocean road is a place I would love to go to!!! Everything about it screams roadtrip! I’ve only been to Victoria, Australia and totally loved it, apart from the cost, heh! Melbourne as a city sure have plenty of things to do but at the same time there is a wide range of offerings as well if you travel out of the city whether into the countryside like Yarra Valley or towards the sea like the Great Ocean Road. All things considered, Victoria is a great destination, and I’m now a bit depressed that it’s not named after me, haha! Really beautiful photos and great post, thanks for sharing! My name is Vicki and I am definitely adopting this as a celebratory day for me! I live in Australia so they might need a bit of convincing – but as part of the Commonwealth I reckon I’ve got a good chance!